This is the living room as you walk into the house. It’s FINALLY here! The home tour you’ve all been waiting for! 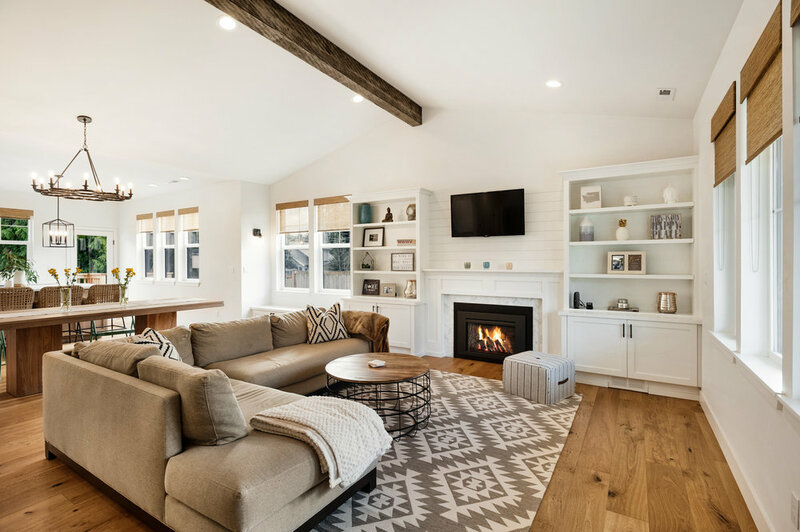 And in case you’re new around here, we recently completed a 5 month long gut renovation of our 1940’s craftsman home - you can read more about that here. We moved back in last December, but it’s been a whirlwind ever since! Unpacking, celebrating Christmas, finding out I was pregnant and trying to get the house styled (that part is still really far off) hasn’t left much time for me to share anything with you. I also was hoping to be way further along in decorating the house before I showed you, but if I’ve learned anything over the years, it’s that patience is a virtue when it comes to interior styling - lots of research and feeling out your space is important! Dining room & kitchen. We obviously still need chairs or benches to go with our gorgeous teak table from the eco-chic furniture store, Tree. For this post, I want to give you an overall feel of the home. The finishes really speak for themselves at this point since I haven’t done much styling yet, but I am excited to share that entire process with you as it evolves as well! Following this post, I will highlight each room - talk about the finishes I chose, the decisions we made during the renovation, etc. I have had a lot you ask me about the process of finding a contractor, sourcing materials, etc. so I will do my best to answer those questions in future posts. So here you have it! Our modern coastal farmhouse! Why I decided to name it this? Well, it’s definitely a more modern take on a farmhouse which is very popular right now (Thanks to Chip & Joanna of HGTV’s Fixer Upper), but I’ve also always had a coastal vibe in the way I style, so this reflects that as well. We live near the beach and water has always been something Wes and I have been drawn to so we wanted to showcase that in parts of our home as well. At one of the dining room flanks a wet bar - perfect for entertaining! The kitchen is one of my favorite parts about the entire house. I just love how our custom wood stained island turned out. Switching from a wood burning to a gas fireplace was a game changer. It makes the space so much cozier and energy efficient! Guest bath // I just love these printed tile floors! Master bedroom - still so much decorating to do in this room! My favorite part is the chandelier. Play room // my intention was to make half this room an office, but so far it hasn’t worked out that way, mostly because this room is in our basement and it’s just not warm enough for me (I’m always freezing). There you have it. I hope you like it! I can’t wait to share even more in detail with you very soon!